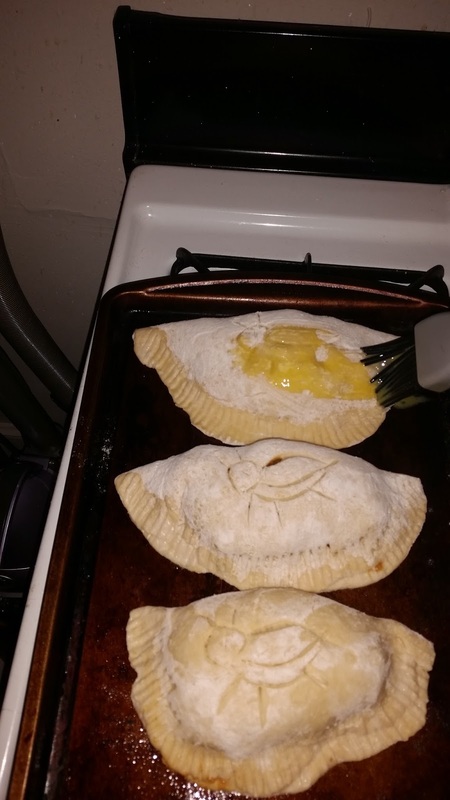 My mom frequently made pasties when I was growing up–it’s a Michigan thing. 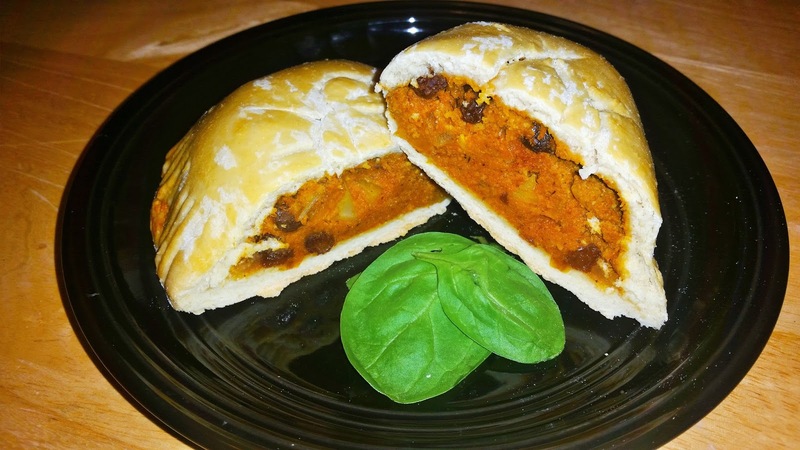 Pasties are a favorite of mine, but to shake things up a bit, I decided to add a Saudi Arabian flare: بهرات السعودية (baharat Saudiya)–Saudi spices. I spent about four years of my life hanging out with Saudi women and they taught me a lot about cooking. Most of our time seemed to revolve around cooking and eating. At any rate, because I don’t remember exactly how their spice mixes were made (every friend of mine seemed to have a somewhat different spice mix that their mothers, sisters, or aunts sent over to the states), I kind of made up my own based on my past knowledge and experiences. Since I get all nostalgic when I remember eating Kabsa (الكبسة) and other Saudi goodies, I tried my best to replicate the mix of flavors that were memorialized in my mind and on my taste-buds. This particular spice mix makes almost everything taste amazing (yes, even lamb kidneys, goat liver, lamb heart, and goat brain). So, I figured this blend of flavors would get people who are apprehensive about entomophagy salivating–that and I’m trying a new thing: I will no longer be making food with visible insects. When you’re trying to convince people that insects–which they don’t deem edible to begin with–are food, I think visuals and olfactory experiences should be manipulated (localize the food to their liking) to help them get past the idea that they are indeed consuming insects. Chirpy Pasty with Potatoes, Baharat Saudiya, and Raisins. Nummy! Now first off, I’ll say you could probably just buy a spice mix online (for example, from Amazon.com, you could buy this). It’s definitely better than the spice mix I threw together–not to sell myself short or anything. So, pasties are fairly easy to make if you like to cook. Though I’ll warn you: they take about two hours to make. -Paprika (to taste, or 1 tsp. I say to taste for all of the spices because I LOVE cumin and I put a lot of it in a lot of the dishes I make at home–those measurements are a guess at what I used, but I don’t normally measure anything when I cook (for the sake of putting recipes on this blog, I’m trying). With this recipe, it’s nice because you can throw a little bit of everything in and then add what you think tastes good. To start, throw the ingredients for the dough into a blender (yes, a blender). I don’t know why I didn’t think of this before, but kneading dough is not fun. Once you have everything in the blender, begin blending and add the water gradually. It really doesn’t take too long and the dough comes out perfectly. After the dough is done being blended, put it onto some parchment paper and stick it in the fridge for about an hour. 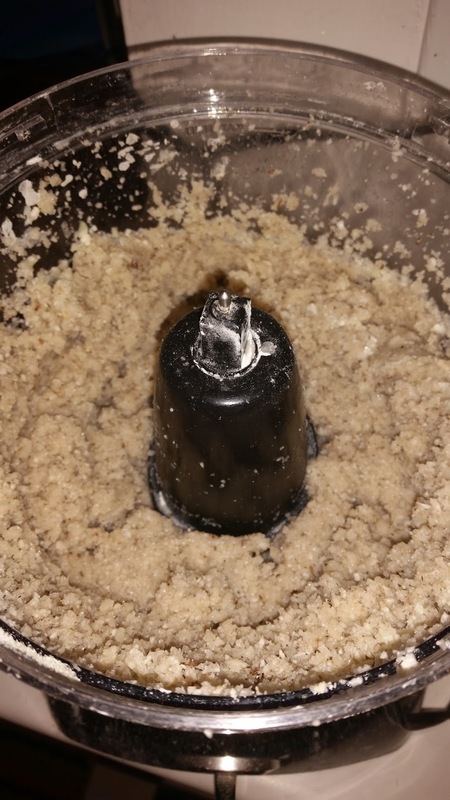 While the dough is chillin, wash the head of cauliflower, cut it up, and toss the cauliflower parts into the same blender you used for the dough. Blend the cauliflower. 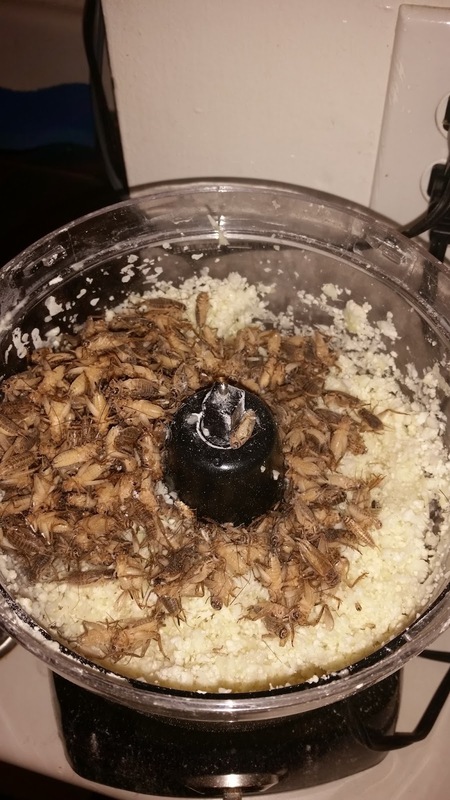 Then, take the cup of frozen crickets, rinse and dry them, and put them into the blender with the cauliflower. After: NO Visible Cricket Parts! Now start dicing the onion and throw it into a pan over medium heat (with the butter) on the stove. Peel and dice the potatoes. Once the onion starts looking translucent and brown, throw the potatoes in. Cook the potatoes and onion for a couple minutes and then add the cauli-cricket mix, along with the tomato paste, water, and spices. Add spices and taste often to get the flavor combination up to par. Once the flavor is to your liking, turn the heat off and throw in the raisins. After the mixture has cooled, stir in two eggs. Since prepping and cooking all of that probably took you around 30-45 minutes, now you can ready the dough. First, pre-heat the oven to 400°F. Take the dough out of the refrigerator and separate it into about six balls. Put some flour on the surface you’ll be flattening these babies out on and get a rolling pin ready with some flour as well. You’ll want to roll the balls into circles that are about 10″ in diameter. 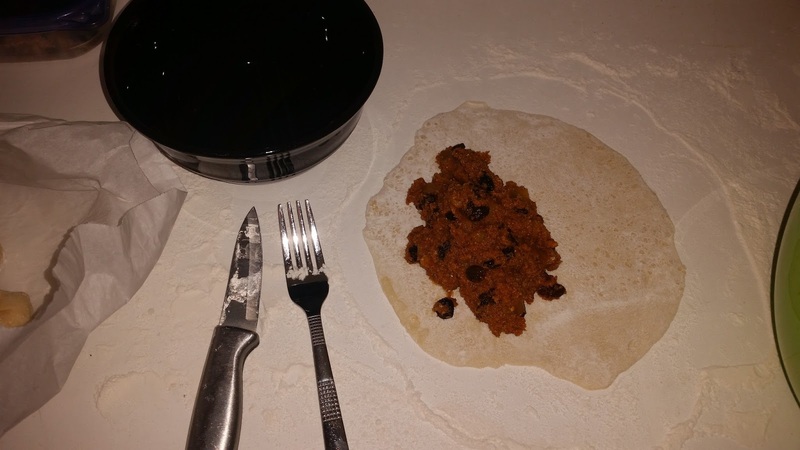 Once the dough is rolled out, add the filling, fold the dough over, use water to seal the pasty, and press a fork along the edge–it functions to seal the pasty, but also makes it look nice. I also carved a cricket caricature onto the pasty. Once you have all of them done, turn the heat down to 350°F and bake for 45 minutes. You can also brush egg onto the pasties–it gives them a nice, finished look. After the pasties are done, enjoy them! I think you could substitute the cauliflower for maybe tofu or seitan–all of them take on flavors fairly well. I wish I would have had yogurt lying around. This would pair really well with yogurt garlic sauce! A great recipe for it is here. They’d also pair well with achari sauce–check out a good recipe for it here–or caramelized red onion chutney, which you can buy at most Indian food stores. 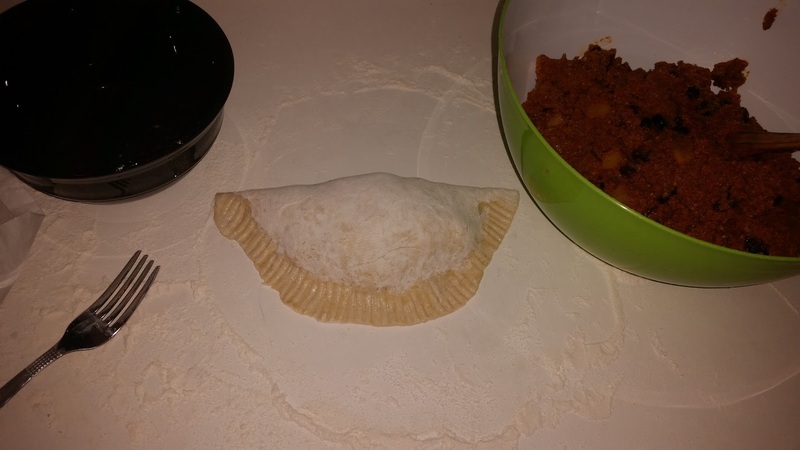 These came out more like empanadas, but I was happy with how they turned out. Previous Post Chirpy Peanut Butter Granola Bars! Next Post Mini Mealy Quiches!